IT was fun in the sun at the Tallarook outdoor pool last week when the Mitchell Shire Volume committee hosted a pool party for young people in the district. The event was supervised by Mitchell Youth Services and attracted close to 100 visitors to the pool that included a free barbecue and free transport to and from the pool. 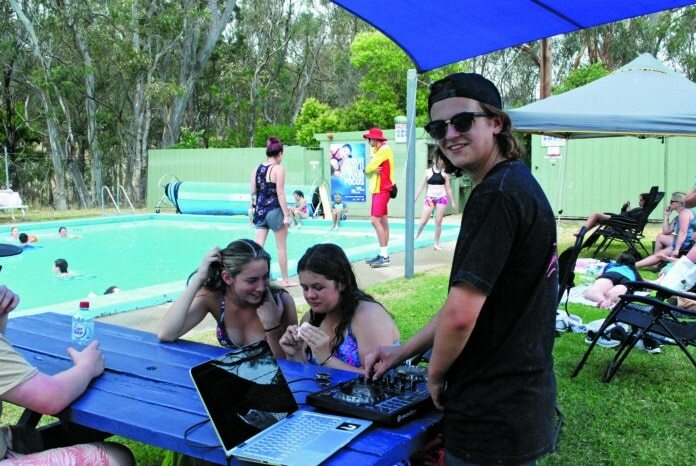 Local DJ James Phillips – AKA DJ Hamez – provided the music that added to the fun atmosphere at Tallarook. The warming 37 degrees also made water play rather attractive. Volume is part of the Mitchell Youth Services Our FReeZA program and comprises a committee of young people aged 12 to 25 years. The Volume committee, in partnership with Mitchell Shire Council, delivers events that are drug, alcohol and smoke-free that meet the needs and interests of the shire’s young people while also providing training and employment opportunities.